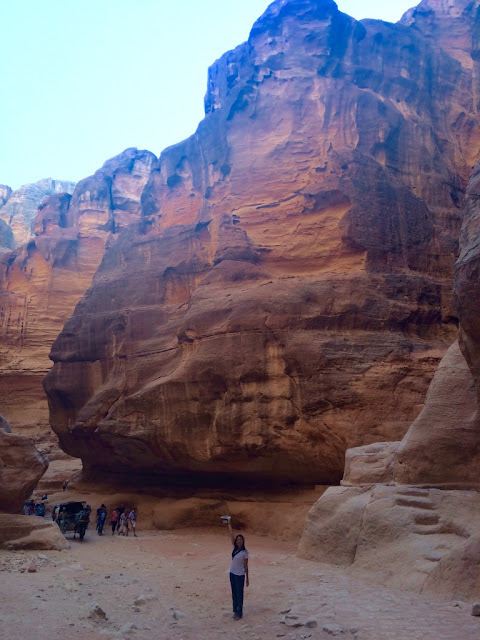 Petra is a place I've been dying to go for forever - the photos look incredible, and I'm totally fascinated by the idea of this lost city carved out of sandstone rock walls. Also, a whole bunch of "Indiana Jones and the Last Crusade" was filmed here, which I loved growing up because I loved Harrison Ford, and I might have written him a fan letter when I was in 2nd grade. 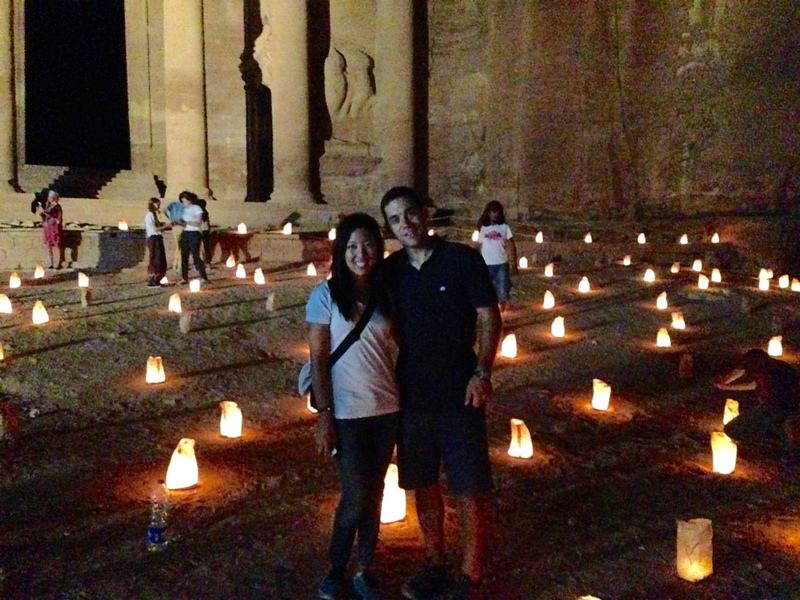 Petra is an ancient city located in the south of Jordan in the middle of the desert. It was built by the Nabateans, an Arab tribe, between 400 BC (uhh is it me, or are these dates getting crazy older!? 400 BC is like, unfathomable to me) and 100 BC. 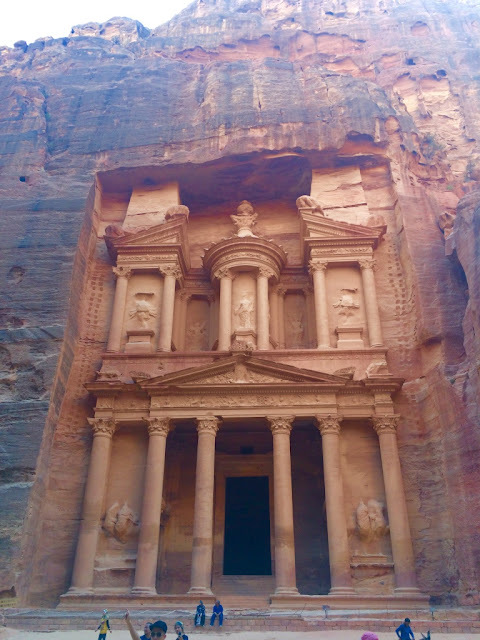 The Nabateans were a prosperous trading tribe, and Petra was their capital city, linking China/India to the Mediterranean. They were worldly and cultural, as they came across so many other tribes and traders through trading. 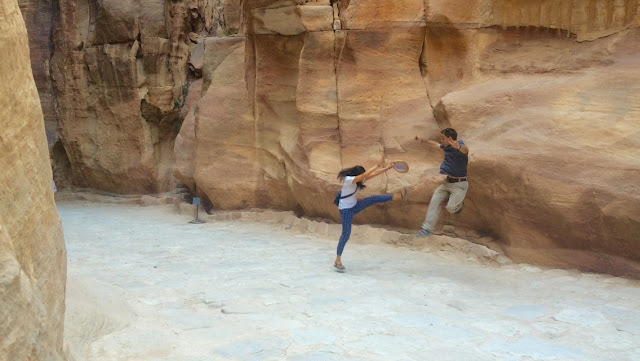 This is especially evident in Petra - which includes an extensive water irrigation system, and gorgeous buildings carved into the surrounding sandstone cliffs. 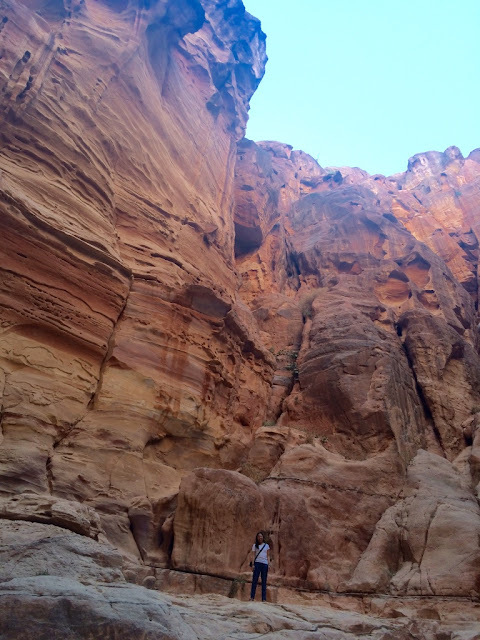 When you enter the park itself, there is this crazy gorge you walk through (called the Siiq - this is the part in Indiana Jones) - it feels like walking through the Grand Canyon: it's basically a thin passage winding between huge sandstone cliffs. You can see evidence of carvings and reliefs all over the walls. The city itself is nothing short of BREATHTAKING - the buildings that are intact are awe-inspiring in their enormity, and you can't believe that people could be capable of something so incredible. 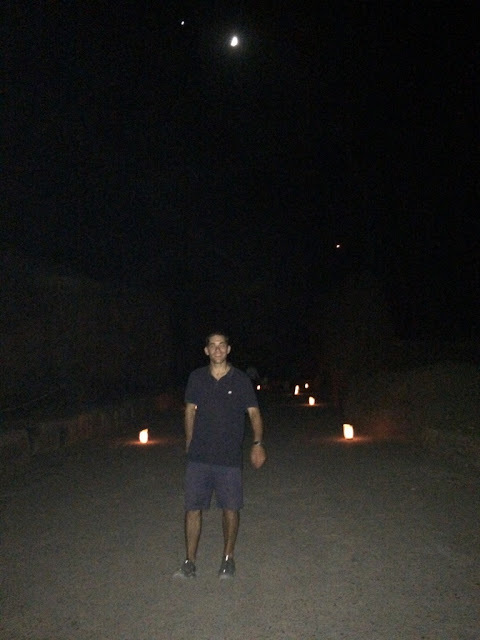 We dropped off our bags at our hotel (right outside the entrance to Petra National Park) after our fun border adventure and a 2 hour cab ride. Petra is fairly expensive, it's 50 JOD (about $70) for a one-day ticket - but it gets more worthwhile the longer you buy for, so a two-day pass is only 55 JOD. So we bought a two-day ticket with the intention of wandering solo and taking our time the first day, then doing a more in-depth tour the second day. Riding past one of the structures - most of these structures were tombs. This one has both Greco-Roman and Egyptian architectural influences, which shows the blending of cultures the Nabateans utilized. I kind of love how forward-thinking this tribe was for their time. Look how huge the cliffs are! 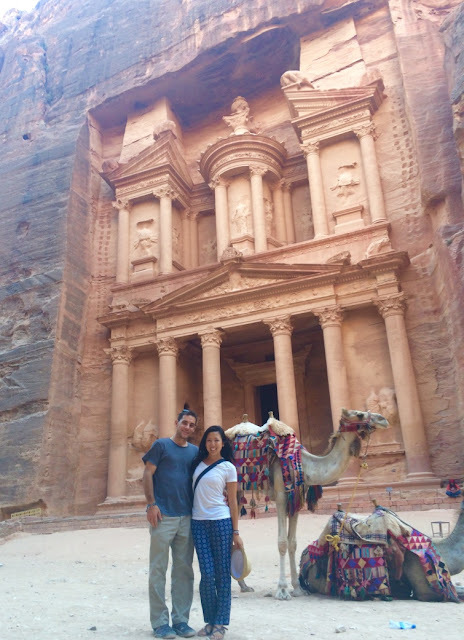 After 30 minutes of walking through the Siiq, you arrive right at Petra's most famous building, the Treasury. The Treasury was originally built as a tomb, but was believed to later have been converted to a temple. Drew titled this "Connie's future child when they get in trouble"
While the Treasury is the most famous building, the entirety of Petra has a zillion (count 'em) more buildings and temples and incredible rock facades - you can seriously take days and days and days to explore and hike and never get to see even a fraction of the park. We only had time for a quick trip to the Treasury before heading back to grab a quick dinner before a night tour we had signed up for. 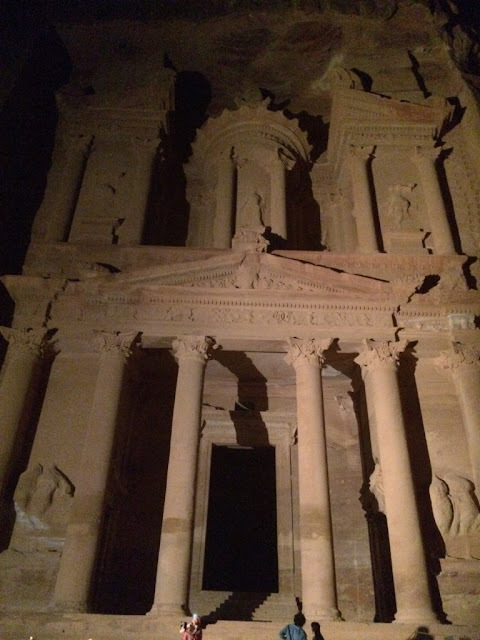 Our night tour was called "Petra By Night", which basically involves taking the exact same route as we had earlier, except in total darkness. In addition to loving NBA, people in Jordan loove smoking. In areas you forgot people ever once smoked in; a.k.a. our taxi driver while driving our taxi, etc. 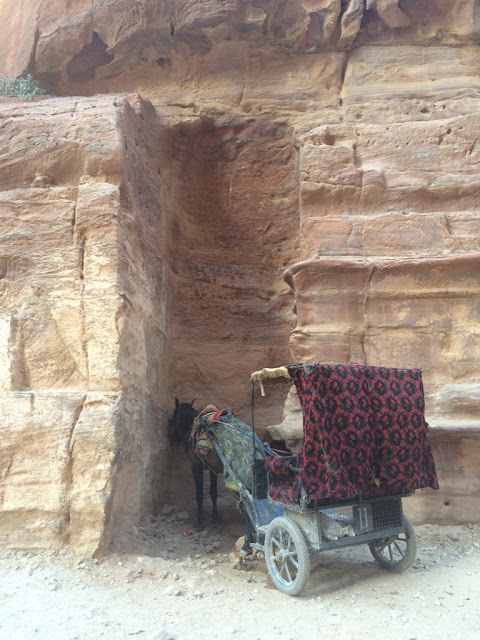 In Petra, you can hire three kinds of animals to take you around (it's pretty intense hiking in some parts): 1. 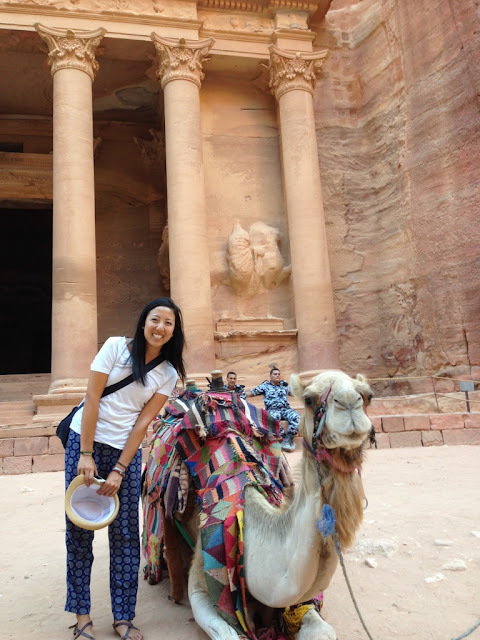 Camels (these don't go very far; they're not good at paths); 2. 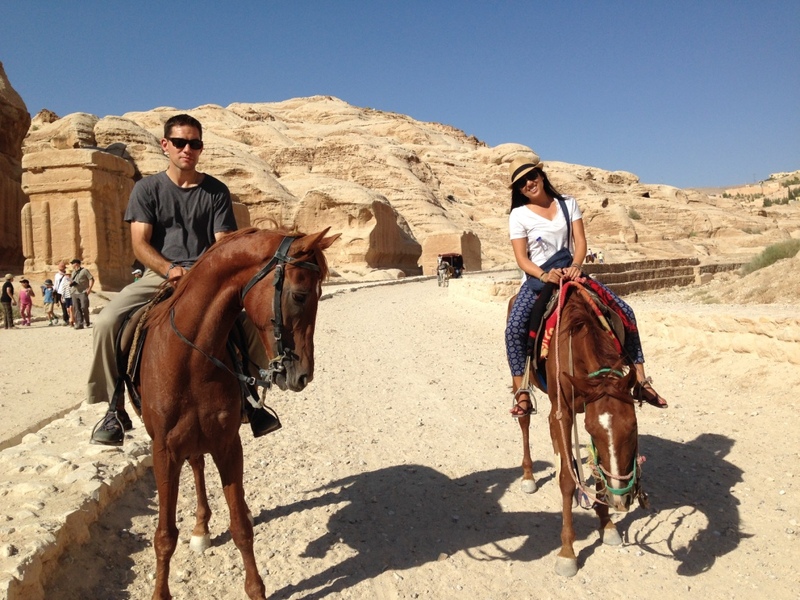 Horses (I love horses but in Jordan with its plethora of animals you can ride, YAWN), and 3. Donkeys/Mules. We had a donkey that lived in a field outside our hotel and would sadly bray occasionally. Desert. Hot. Bring the sunscreen. 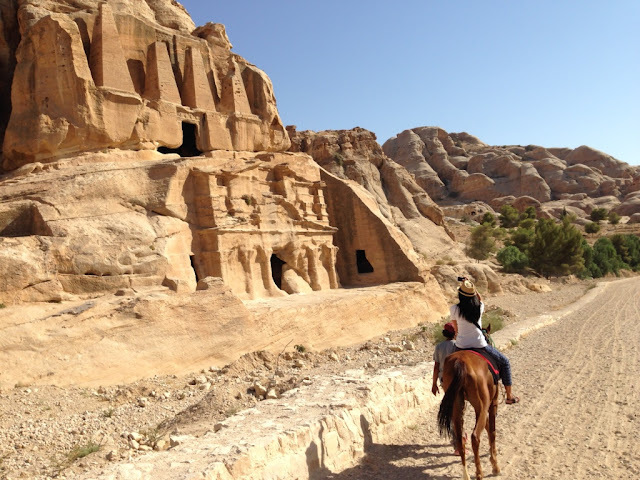 Next up - we spend the next day exploring Petra more in-depth. I seriously cannot believe HOW MUCH there is to see in this place, and how much more you can explore: more than just the Treasury (which is all you ever see in pictures), and more than pictures can ever depict. This is seriously one of the coolest places ever.